I feel like I’m flying through the items on my 30 before 30 list! Last weekend, I completed my first triathlon of this year, third one ever. I started them last summer and enjoyed it enough to keep it up this summer. And there was one in Fairhope, AL – the town next to where my brother lives. The perfect excuse to visit him, my sister-in-law and baby nephew!! I trained for a while – I really have no idea how long. The day was perfect – warm, but not hot, and mostly overcast. I’m always the most worried about the swim, especially since this one was in the bay. 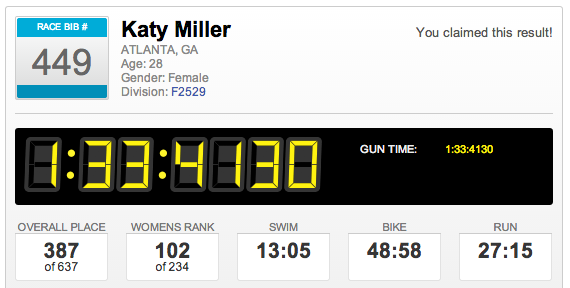 But overall I did pretty well and was happy with my time. It’s hard to compare race to race since distances are different, but below are my time from last weekend (on top) and my race last August (on bottom). The only difference was that the bike this time was 4 miles longer. 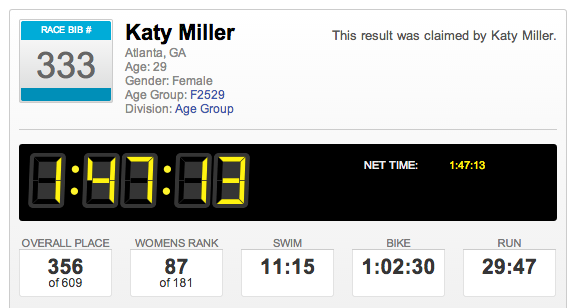 It’s hard to get a clear large screenshot, but my swim time improved by almost 2 minutes! I would definitely do this race again. I enjoyed swimming in the bay more than the lake and the bike route was beautiful. Categories: Wonderful Wednesday | Tags: 30 before 30, Fairhope, triathlon | Permalink. So awesome!! Proud of you!